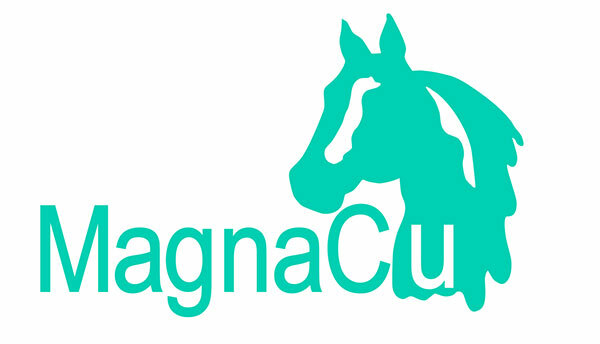 To order blankets or other products, visit our MagnaCu line. Blanket features closed front, elastic leg straps, and contoured fit. 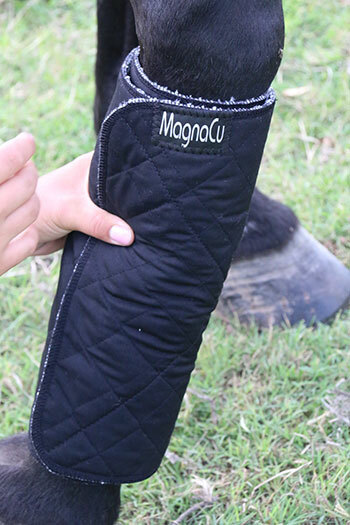 Our MagnaCu Blanket is designed to keep your horse fully balanced with our strategically placed magnets on major acupuncture meridians and points. 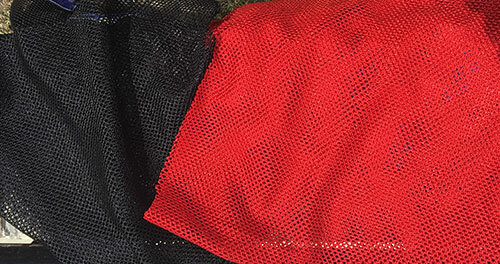 The mesh portion of the blanket is copper infused fabric. This combination provides soothing delivery of magnetic therapy and copper therapy. The blanket addresses the major muscle groups, as well as the stomach and lung meridians. Great for those sore muscles as well as the finicky eater and bleeder. 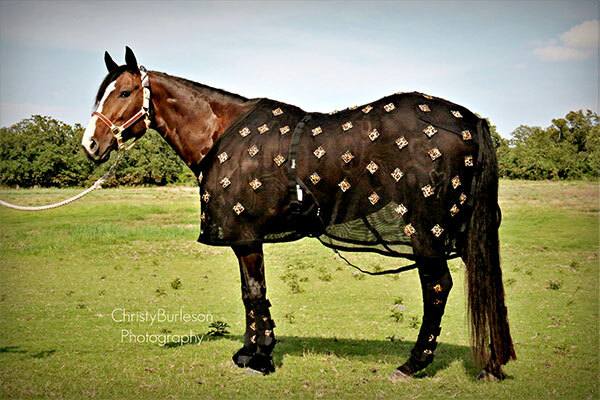 Whether you are going on a short or long trip, this magnetic horse blanket gives you the confidence that your horse is ready to compete when you arrive. Our blanket is made of a copper infused mesh which is cool in the summer or can be used under a winter blanket when the temperatures drop. The magnets we use are Grade 8 Ceramic unipolar. Remember this is the only magnetic/copper horse blanket designed to keep your horse going down the road. Helps reduce muscle soreness, aids in respiratory problems, reduced incidents of colic, reduced incidents of stomach ulcers, and better digestion in your horse. 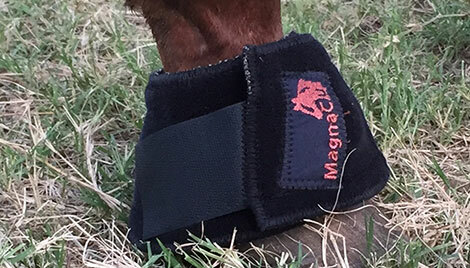 Magnetic bells boots are designed to help relieve symptoms of navicular, abscess, quarter cracks, etc. Each bell boot contains 7 ceramic magnets strategically placed to give the hoof therapy where needed. This fleecy, magnetic bandage is ideal for treating soft tissue injuries, bruises or tendon strains. That's because the outside is an exceedingly soft pile. Inside is a nice comfy foam with 10, 14,800 guass neodymium magnets strategically placed to give your horse's leg the best therapy available. Measures 30" length, 12" or 14" height. Outside is nylon, inside is fleece. Apply under a polo or standing type wraps. Wrap as a standing wrap. Made with a soft quilted exterior, PHT Magnets, and Lined with Copper infused fabric. Deep Navy Blue color. 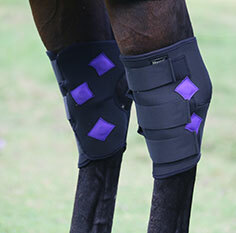 This new design stifle wrap provide convenient, effective treatment coverage. 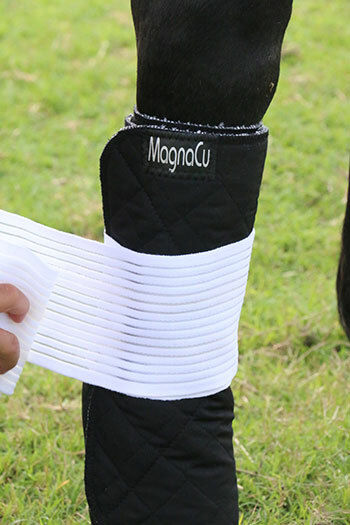 MagnaCu™ Stifle Wrap has finally made it easy and convenient to provide magnetic and copper therapy for your horse's stifle area. Stifles are difficult to treat and maintain. 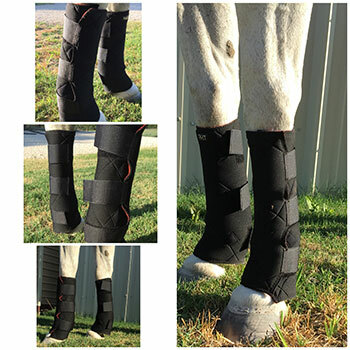 This new design stifle wrap provide convenient, effective treatment coverage. Perfect for stifle injuries or edema and swelling associated with strenuous exercise and performance. 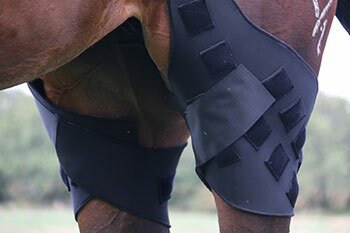 Even older arthritic horses will benefit from this easy to use wrap. MagnaCu Stifle Wraps have been streamlined to allow for a closer fit. The easy way to keep circulation flowing in the legs of your horse. 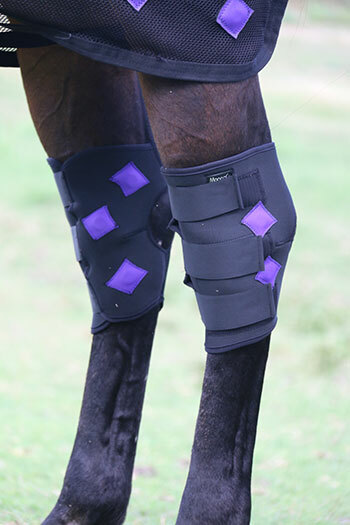 Great for a horse with a bowed or sore tendon, suspensory injuries, hauling, standing in stall, etc; Great antimicrobial and copper therapy combined with PHT Magnetics. Not for use while riding or turnout. These are an "at rest" product. Customize your boots by choosing your square color with a choice of: Black, Leopard, Pink Aloha, Purple Aloha, Green Aloha, Blue Island, or Brown Island. Used to relax your horse naturally with neodymium magnets - 14,800 guass strategically placed and sewn in at poll area. 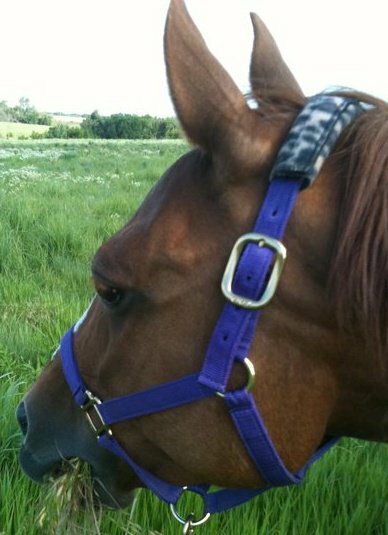 Attaches easily to headstalls and halters. Best when used on the poll area. Great for Poll and TMJ Problems. Well, took my mare to the chiro/vet/dentist the other day and she was pretty much a mess. However, It was ONLY her poll and neck and we are convinced this goes back to something that may have happened in her younger years. Well, after talking to a wonderful friend, I learned about a product that may help this poll problem. I ordered it and got it and tried it last night. 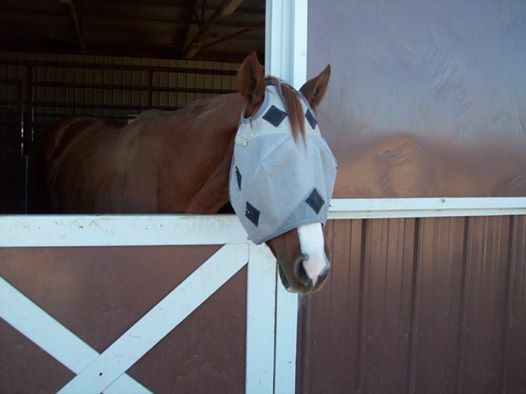 Within 5 min of having this on, my mare had softened in the face, licking the lips and half asleep! I really think that this is going to help her chronic poll problem and I am VERY excited! Thank you my dear friend for suggesting it to me! PS. She also made a heck of a run last night without any head tossing or fits! We offer a 30 day manufacturer defect warranty.